I don’t know if I’m a lazy, slothful gardener, or just a brutally honest one, but either way I’m hoping for a hard frost pretty soon. I’m tired. My garden is tired. A good significant freeze, a cleaning of the summer slate, an official change of the seasons, that’s what I need. Given my perennial neglect, fall flowers always hold a soft spot for me. Anything that can brighten the garden in September is a bonus. Take Asters, rising up above the weeds of late summer. Sure, go ahead and curse the Aster yellows causing the lower leaves to fall away all summer, making the plant look ridiculous, but the bright pinks and blues as a surprising upper tier to the late garden redeem almost any neglected space. Grasses hold their own all season, but shine in the fall as vertical accents even as other plants droop and hunch like my sore autumn back.Trees and shrubs, though, are truly a lazy gardener’s friend. For a minimum of work, they blossom and grow dependably. In the plant world, it’s like something for nothing. 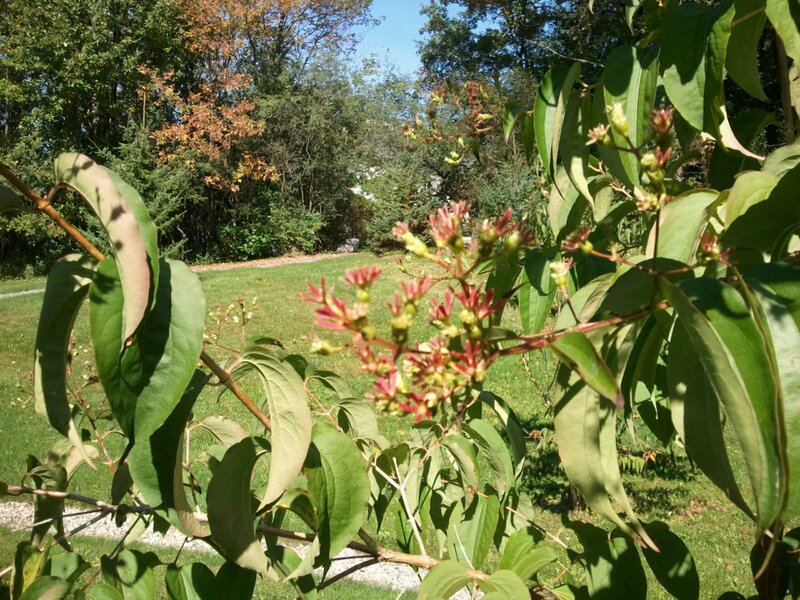 Seven Son Flower, Heptacodium minicoides, is a recent introduction into the plant world. Originally discovered by the famous plant explorer E.H. Wilson in 1907, at Hsing-shan in western Hubei province in China. Found on cliffs about 3000 feet above sea level, only one seed was found, so dry specimens were collected and brought to an herbarium. Another expedition found the plant in the Hangzhou Botanical Garden in 1980, and two seed collections were made from a single plant and distributed to various arboretums. Most active in spreading the plant around was the Arnold Arboretum in Massachusetts. (Read the complete history ) As far as I can tell in my reading, all plants in the trade trace back to that single plant. Seven Son flower gets its name from the seven headed inflorescences on the flower cluster. The white flowers wouldn’t draw much attention in the spring, as they honestly don’t hold a candle to a lilac. In September, though, they draw the eye through the tired landscape, showing off against the pale tattered leaves of most trees and shrubs in the late summer. The plant seems to grow somewhere between 10-20′ high, and about 10-12′ tall. 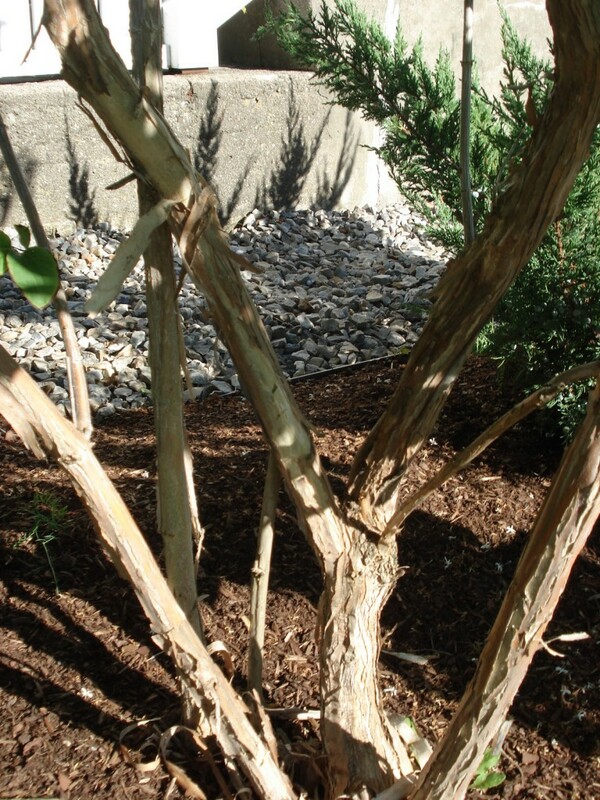 It’s one of those gangly plants that defy the easy tree/shrub category, although the finest specimens seem to be pruned into attractive multi-stemmed small trees. The advantage to this little bit of work is the ability to show off the bark, which peels in long strips in alternating cinnamon and light brown shades. The leaves hold opposite each other along the stem (showing off its familial relation to Honeysuckles, the Caprifoliaceae) and stay dark green, pest and disease free all season. Some books claim no fall color, but we seem to get a dependable, but not stunning, gold. Further south, once the flowers fall, the calyxes stay attached, and while the seeds are forming, turn bright red, looking like a second bloom on the plant. Honestly, I’ve never noticed this in Vermont, and the book Landscape Plants of Vermont states that the the season ends too soon for this Cape Myrtle effect, but I’ve managed to photograph some last week, and I’m watching. 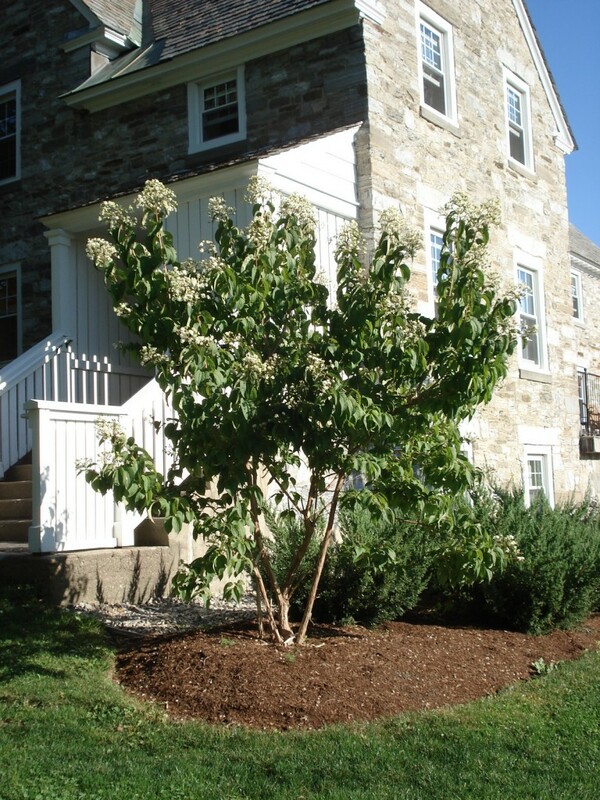 For the observant, there is one planted near Painter Hall, just off of Old Chapel road, pruned to a single trunk. Other clump forms are on the south side of Munford, the east side of Pearson Hall, and a couple other places I’m forgetting. 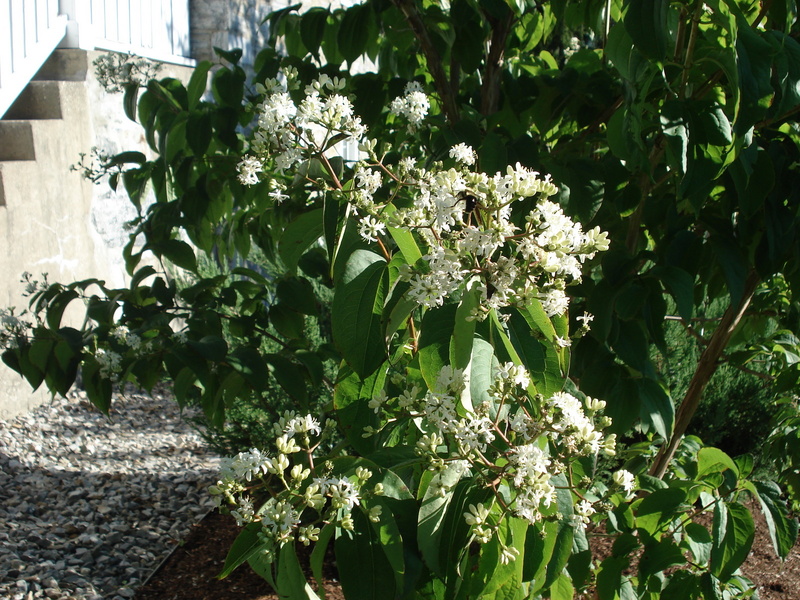 Heptacodium seems to do best in full sun, but is at least partially shade tolerant as well. This entry was posted in Midd Blogosphere and tagged Blooms, fall color, flowers, landscape, Trees on October 2, 2011 by Tim Parsons. I’ve been reading quite a bit this fall in various newspapers, web sites, etc. about the science of leaf change, and I thought, well, heck, there goes another blog post. I don’t see the sense to retread ground others are covering. By now, you’ve probably read that leaf color changes by the shortening of day-length light triggers the tree to begin shutting down the leaves, and that chlorophyll breaks down, and sugar is absorbing into the tree. In a nutshell, the veins connecting the leaf to the tree are closed (abscission layer), and once this is complete the leaf falls. Weather does play a part in leaf color, and in the color you see in the hills as you visit your children on parent’s weekend here (Hi parents! Your kids are doing fine. They want more money.) 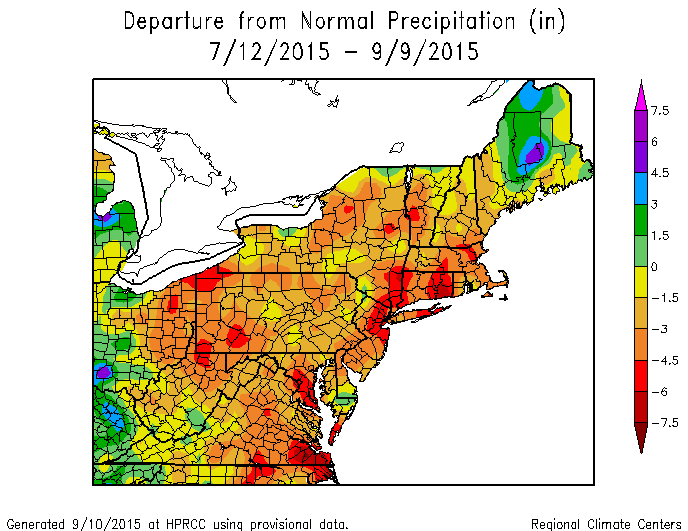 Many articles have talked about warm weather delaying fall, cool nights are good, drought bad. It’s easy to understand, though, if you think of it in terms of plant health. A happy, healthy tree in a good growing season will more than likely have pretty spectacular colors. 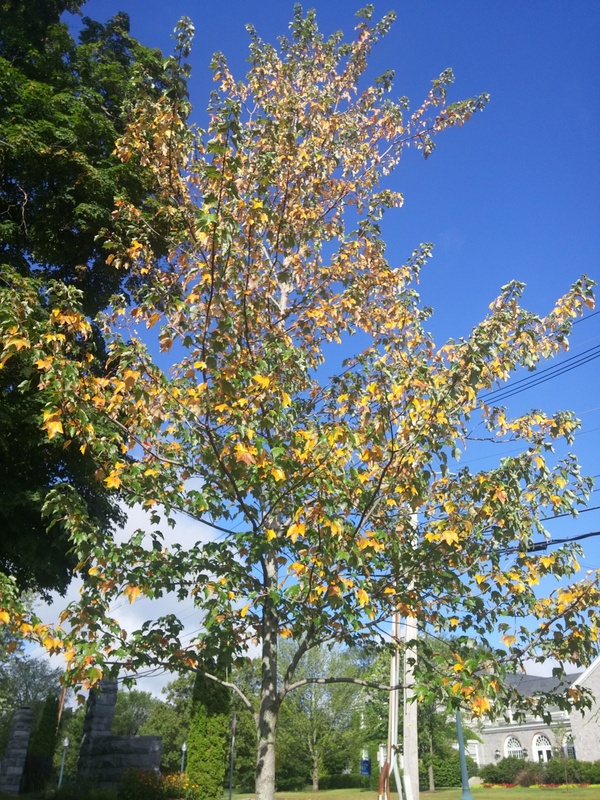 The factors responsible for bad fall color aren’t good for the tree health either. 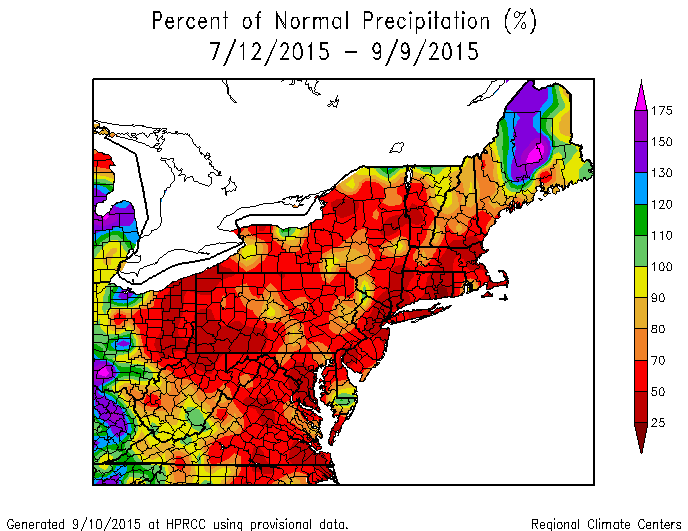 Drought is bad for fall color, and also bad for the trees. 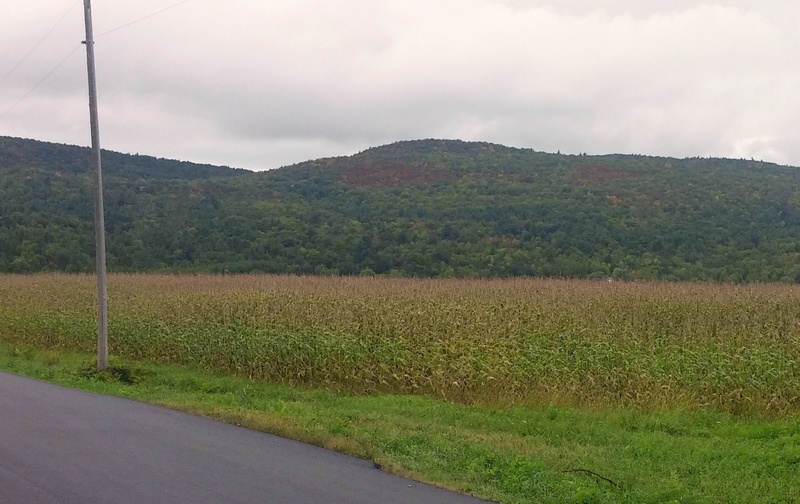 Southern Vermont this year had a pretty bad late summer drought, and when I was on route 4 a week or so ago near Woodstock the leaves were terrible, turning brown and falling off, rather than turning nice colors. Here at Middlebury it’s been a dry September, and then the recent rain storms came at just the right time, and the leaves held on long enough to turn well. Warm fall days and cool nights? Good for sugar production, and the breaking down of chlorophyll in the active leaf. 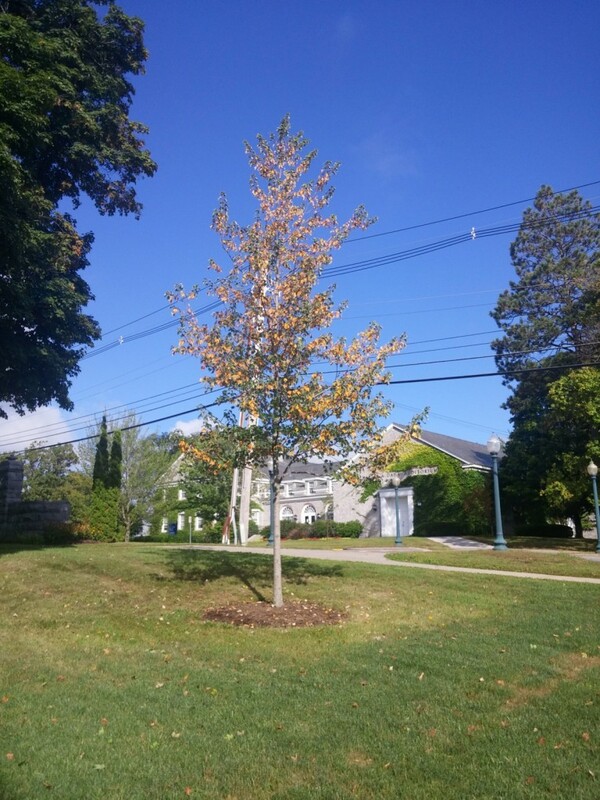 A late spring or a severe summer drought can delay fall color-the tree holding on to it’s leaves as long as possible, storing as much energy as it can before winter. Another leaf color fact plant geeks have probably noticed is called the Leaf Wave Model. An article at the University of Georgia discusses this: Peak color is an opinion. Different trees turn at different times, and in differing colors. Yellows dominate early, then oranges as both later trees turn, as well as some yellow leaves becoming more orange. Finally reds dominate the landscape, with accompanying orange. Browns come last, generally in oaks. The leaves in Vermont are spectacular because of the forest cover types found here, yellow Ash, orange and red maples, along with splashes of green from Pine and Spruce. By paying careful attention to the mountains in the fall you can watch this leaf color wave happen. Some other reading I’ve been doing this fall was about the color red, something I’ve never thought about. An interesting question for botanists has been “Why red?”. As chlorophyll disappears from the leaf, the other colors emerge, such as yellows and oranges provided by Carotenoids. Red, though, is expressed through Anthocyanin, but is not found in a leaf, and must be produced. The question, therefore, becomes why would a plant be producing a compound, expending energy, at a time in it’s life cycle when it is trying to store and conserve? There are two schools of thought, and probably both are correct, some for some plants, some for others. One theory is that anthocyanin is produced in trees in nitrogen poor soils. In some varieties of trees, as the green chlorophyll breaks down, the leaves are vulnerable to bright sunlight, and this sunlight breaks down the produced sugars, thereby not being absorbed back into the tree as energy storage. The red pigmentation acts like a barrier from the sunlight, allowing the tree to absorb more of the sugars it has produced. Nitrogen poor soils means the tree would have produced less sugars, being weaker growing, so more red pigmentation would conserve more of the valuable food. The other theory is one of coevolution, that red leaves are a signal to insects as a repellent, a red warning signal to the insects attempting to use the tree as an overwintering site. A study has shown this in aphids and apple trees, that wild apple leaves turn red in the fall, and suffer less aphid predation. 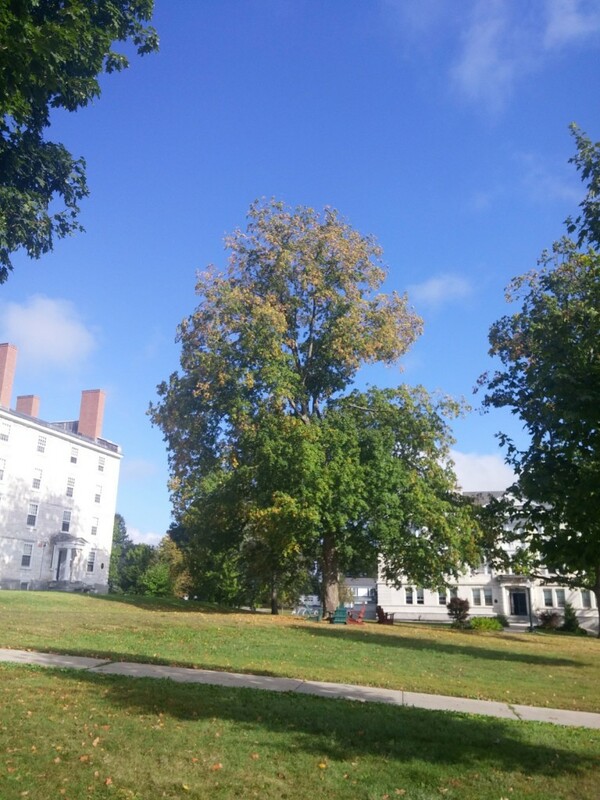 This entry was posted in Midd Blogosphere and tagged ecology, fall color, Insects and Diseases, Plant Pathology, Trees on October 7, 2010 by Tim Parsons.